This knitting technique is called My so called scarf on the internet and Inger taught it to me this Sunday at Knit Lab. I did a lot of mistakes while I was learning it (I guess I was distracted by other things and the people around me), but now I know it by heart and can knit without looking at the written instructions I wrote. It’s only two different rows, so it’s not that complicated and it’s great to knit without the pattern. When I started to cast on at KnitLab I used 5 mm needles but those made the scarf thick and clumsy, so once I came home I ripped it up and started anew, this time with needle size 9 mm! Love those thick ones! 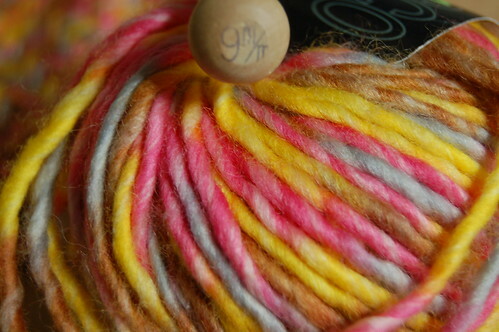 I have a couple of skeins of this yarn, Jazz print (from Grignascoa, Italy), and I love the colours of it. It’s 100% merino new wool, yummy! Stacey has published the pattern and named it My so called scarf. Video instructions are very helpfull, so cast on and start knitting! My so called scarf video instructions with another way to do the knit side. 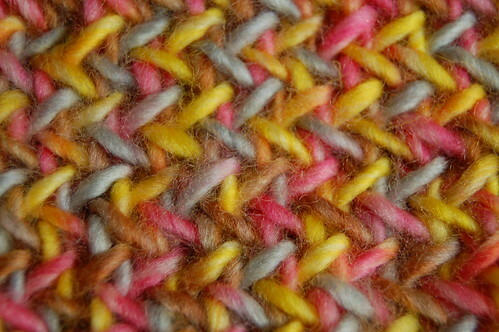 it *is* a fun pattern, I am working on one now too – I love the texture. Good luck with your project, it looks great! Those colours… so very wonerful. Happy knitting! Ciao, I from Milan, Italy. I read and love your blog, from many years, and the photo of Stockholm (i love it!). Sorry me for my english. Bye bye. Hi Hanna, thanks for entering my giveaway. The scarf is looking great. The yarn is really beautiful. What a neat pattern! 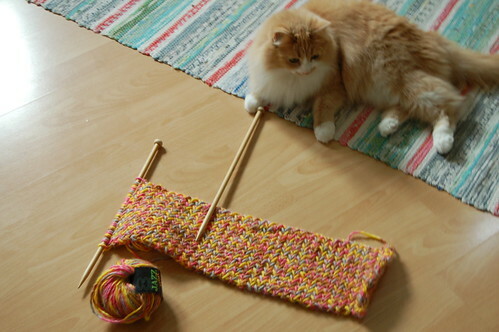 i love how the kitties always have to be next to the knitting. mine too! great looking scarf. oh lovely texture…your blog is beautiful and the photographs are just lovely. i am off to check out your book. it looks absolutely amazing! Snygg halsduk. F?rs?kte l?sa m?nstret….har du n?gon ?vers?ttnig f?r engelska sticktermer? i love that scarf! the pattern is original and beautiful. congratulations on your book and interview, hanna! i am also in love with your cat. love your blog. thanks for the video links. i’m a knitting newbie and couldn’t figure the pattern out. the video helps so much. 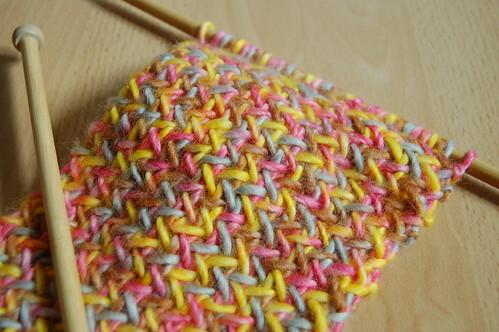 This pattern is really good for multicoloured yarn! I downloaded this pattern last winter, but haven’t tried it yet. It looks great! And I also want a cat like yours to keep me company when I knit. :) She’s lovely! Filla, if you need the knitting terms in Swedish you can translate them at sticklistan! Good luck! nice colour, and omg you are so neat! Those are lovely colors. I wish I could knit. I’ve “learned” three times, but never actually learned. This pattern looks fantastic and the yarn, too. Hmm, I think I’ll need to start one more knitting project. I love the pattern! I must give it a try. I’ve been meaning to head over to Knit Lab to check out the yarn selection but I’ve been busy. Knowing that there are such delicious yarns there, I must go asap! waw, that pattern is lovely! I have never seen it! I’m making this scarf now too. Except after I knit a few inches of the original pattern, I decided I didn’t like the purled side. So I frogged it and started knitting some variation I made of it. Instead of knitting one side and purling it, I alternate it each stitch, so it’s kinda of a ribbed stitch look. I’m SO glad I looked at your knitting posts! I started that same scarf but stopped after I made a mistake, because I couldn’t figure out how to fix it! Your scarves are beautiful… it really is a great stitch pattern, isn’t it? 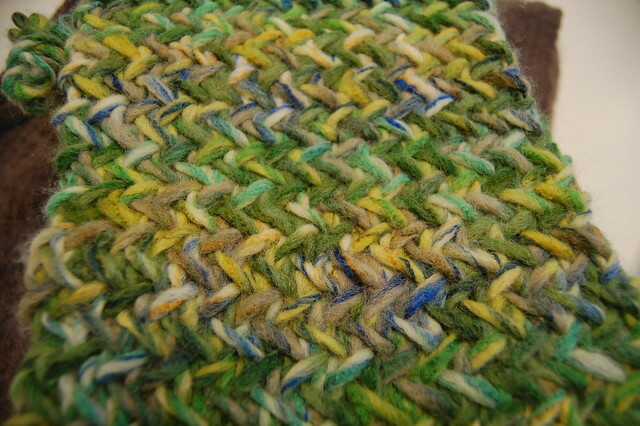 I love how it looks with varigated yarn… so much so, that I may need to go and start a new scarf right now! Take care!